Fractured fairy tales. Re-imagined classics. Call them what you will but traditional fairy tales have been reincarnated again and again through various mediums. They have been parodied, merchandised by the Mouse, and transformed, often exploring themes and teaching lessons unaddressed or counter to those set forth in the source material. Gabrielle-Suzanne Barbot de Villeneuve’s Beauty and the Beast is no stranger to such treatment; however, playwright Reina Hardy’s play Glassheart, presented by Everyday Inferno, builds upon the structure of the Beauty and the Beast narrative* to explore some difficult issues. Glassheart thrusts the story of Beauty and the Beast into the 21st century, with the Beast and his one remaining servant, a loyal lamp who is eventually bestowed the name “Only”, moving into an apartment in Chicago where the musicians downstairs fill the small space with a pleasant ambiance and the gingerbread-baking land lady enjoys small children just a bit too much. As the Beast laments his ongoing cursed appearance, Only maintains an upbeat attitude, turning the apartment into a home and helping to lure a young neighbor, Aoife (whose name happens to mean “beauty”), into meeting the Beast in disguise. In exchange for Aoife agreeing to stay at the apartment with the Beast, in the hopes that he will return her kindness and that she will learn to love him, thereby breaking the curse, Only assumes Aoife’s job, feeds her cat and serves a placeholder for Aoife’s “normal” life. However, as time passes, Only begins to question her role in the Beast’s life, the personal sacrifice that she will make if the Beast breaks the enchantment, and the meaning of her very existence. Aoife similarly begins to consider the value of her life within the sheltered comfort of the Beast’s home. Rather than being a tale of true love, Glassheart is a tale of self-discovery, of the unique nature of relationships and of the search for identity in life’s pursuits. After all, not all of life’s difficulties can be resolved with a kiss. Hardy does an elegant job of intertwining the familiar narrative of Beauty and the Beast with modern settings and characters without destroying the integrity of the foundational tale and with an appreciable charm and wit. Some interactions and portions of the play reflect a refined writing style – minimal yet packed with complex themes and issues. For example, in one scene the Beast reads what he says is the ending of The Hunchback of Notre-Dame to Aoife and Only, which Only celebrates with gleeful exuberance, recounting how Quasimodo swoops in to save Esmeralda. However, after Only leaves the room, Aoife calls out the Beast’s deception and failure to disclose the real (and far sadder) ending to Only. It is a beautifully-crafted scene that turns out to be quite revelatory with respect to characterization. However, Glassheart falters a bit in narrative with respect to both the treatment of the Beast and the introduction of the Witch. The Beast’s huffing and puffing despair grows tiresome as the play progresses, and, given the jump in timeline, one wonders if the Beast has maintained this despondent demeanor for the several hundred years that have passed since his transformation. The Witch, while bringing an enjoyable levity to the play at times, has murky motivations for her engagement with the other characters and feels underdeveloped (as if her story does not truly intersect with the story being told**). Caitlynn Barrett’s set design is striking for a production of this scale, evoking a feeling of old world charm, cosiness and steady wear. 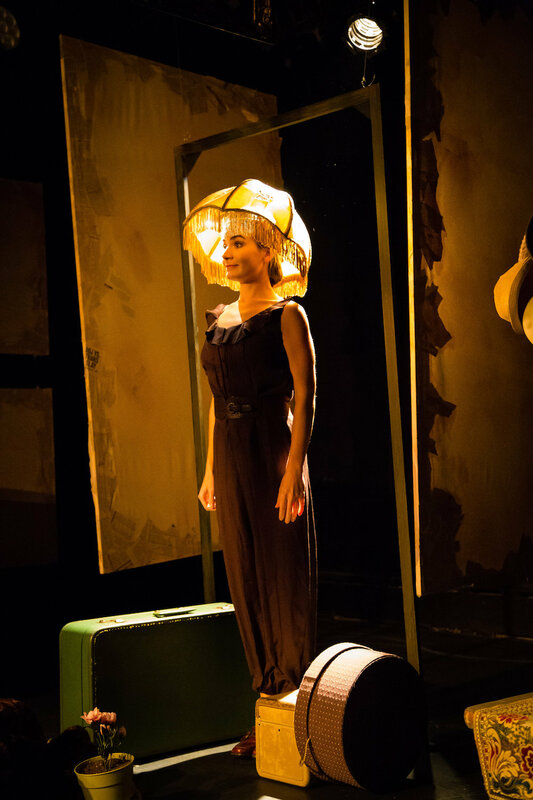 The interplay of personal illumination and the use of lamps in the space is particularly stunning, and Ali Hall’s lighting design reflects both the changing tone of the work and the importance of light in the story. Sam Kaseta’s sound design and compositions embrace and elevate the narrative, creating music that does not intrude upon the action but compliments it. Anais Koivisto, who does double duty as both director and costume designer, has adorned the cast in simple clothing with accent pieces that reflect the otherworldly setting, although the choice to place Aoife in a shiny ballgown seems a heavy-handed homage to Disney princesses. The ensemble of Glassheart, although small, is quite strong. Christopher Alexey Diaz laces many of the Beast’s lines with a subtle and sometimes startling growl, deftly morphing between a well-spoken man at ease and a hunchbacked angry animal. Both he and Virginia Roncetti (portraying the Witch) struggled at times with lines; however, they recovered well and crafted intriguing characters. Carey Cox brought an awkward likability to Aoife, making her both believable as the Beast’s potential savior and utterly unthinkable as more than a friend. Cox’s Aoife seems both imperfect yet strangely alluring, an outsider to the world of the Beast but strangely at home in it as well. Meghann Garmany’s performance as Only is of particular note – Germany’s physical comedy, quirky likability and doe-eyed wonder as Only not only bring an upbeat optimism to balance the heavy emotional moments of the show but also make Only standout as the true protagonist of a play where she is neither the defined beauty nor the defined beast. Glassheart may have sprung from a tale as old as time, but it proves to be more a tale of modern times – suggesting that love comes in many forms, that labels can constrain a person from reaching their full potential or appreciating their own worth, and that a life less ordinary may be more valuable than some notion of what is ideal or normal. Even with its faults, Everyday Inferno’s Glassheart is enchanting – an engaging, funny and, at times, superbly subtle production that does justice to its source material while also reinvigorating it with new meaning reflective of modern times. *We are talking Villeneuve’s narrative – not the heavily altered form of Beauty and the Beast (twice) produced by Disney. **Which, of course, it does not. Perhaps Hansel and Gretel were still walking through the woods of Illinois and the Witch figured that she would make friends with the neighbors in the interim.